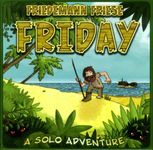 Neat little solo card game where you are Friday - a native on the island that Robinson Crusoe is shipwrecked on. It's your job to teach RC how to survive before the man gets killed by pirates or the other dangers that infest the island! Everything present and accounted for. Minor box wear but otherwise in good condition.